Lookit him, all young and cute. There is no disputing the fact Elvis changed rock n roll forever, bridging the gap between “black” and “white” music, stirring up controversy and breaking new ground with every song, with every gesture, every dance move. Maybe it is Michael Jackson’s death compelling me to take note of Elvis this year. I never have before, though I do have a moment of silence for John Lennon every December 8th. I think the difference between Lennon and Elvis or Michael Jackson is Lennon had no culpability in his own death and that is why I mourn him more. 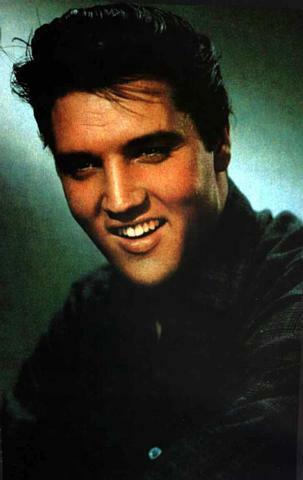 I also think Lennon had more to offer whereas Elvis had run his own course by the time of his death. The music world suffered a greater loss, I suppose is my point. All that said, it is one of my goals to visit Graceland someday. I suspect it is a desire spawned more by Paul Simon than any lingering affection for Elvis but Lisa Marie will still benefit from my pilgrimage. But I’ve reason to believe we all will be received. The video is what I would have played at his funeral if I were in charge, as I believe I should be of most events.